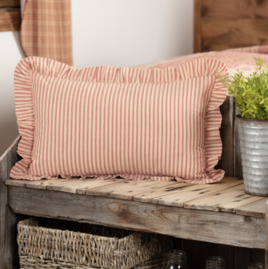 Add farmhouse style to your bedroom with the Sawyer Mill Red Ticking Stripe Fabric Pillow. The timeless textured cotton fabric in country red & dark tan ticking stripes that offer a simple, romantic feel you can't resist. Add farmhouse style to your country home with the Sawyer Mill Red Ticking Stripe Fabric Euro Sham. 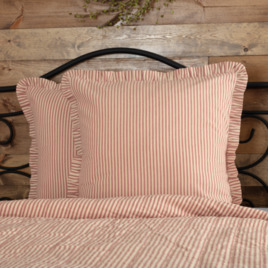 This sham features textured cotton fabric in red & tan ticking stripes . 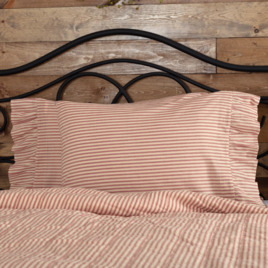 Coordinates well with the Sawyer Mill Red Ticking Stripe bedding. Add to your farmhouse style with the Sawyer Mill Ticking Stripe Sham. Features ticking stripes on textured cotton fabric, finished with a straight edge for a clean, crisp look. 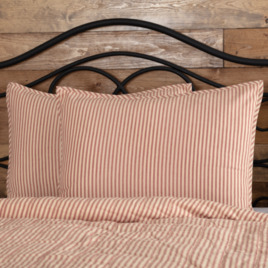 Coordinates perfectly with the Sawyer Mill Ticking Stripe bedding.